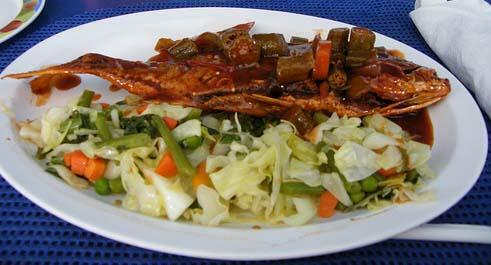 There are a lot of different versions of Jamaican Brown Stew Fish. This method was most commonly used by the people in the southeastern part of Jamaica. The CPC Mushroom Soy Sauce and JCS Browning are the secret ingredients that gives the recipe the authentic taste of the Islands. Wash the fish in a lime juice/water solution. Season fish with salt and black pepper. Heat the oil in the skillet on high for 2 minutes, then turn the heat to medium. Carefully place fish into the oil in the skillet. Pan-fry fish until golden brown. Do not move fish around while it is frying. Discard the oil and replace with fresh oil. Sauté the onions, garlic and green bell peppers together. Cover for a minute. Add water and allow to cook for another five minutes. Add the ginger root, mushroom soy sauce, scotch bonnet pepper, thyme and browning. Cover and cook for 5 minutes. Add salt to taste and then add fish to stew and simmer for 3 minutes. Serve with rice & peas or ground provisions. Enjoy Your delicious Country Style Brown Stew Fish! If you loved this recipe, be sure to check out our Brown Stew Chicken recipe as well!